Anesthesia of the testicle and epididymis is best understood starting from the embryological origin of the respective structures. 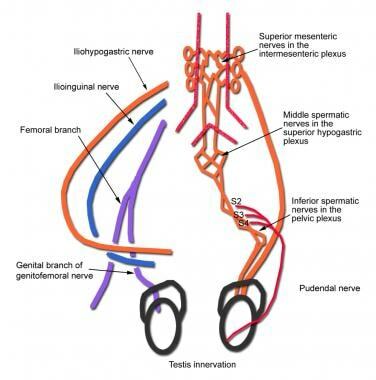 The testes are embryologically derived from the same level as the kidneys and, therefore, share a common level of innervation, that being the T10-L1 level for pain conduction and T10-L2 for sympathetic innervation. As the fetus matures, the testes descend into the scrotum. The scrotum is innervated anteriorly by the ilioinguinal and genitofemoral nerves, while the posterior portion of the scrotum is innervated by the perineal branches of the pudendal nerves. Anatomy is shown in the images below. Anatomy of the urogenital system. Spermatic cord and adjacent structures. The afferent fibers for the internal contents of the scrotum run in the spermatic cord. It is at this site that an anesthetic nerve blockade is best approached, as the nerves are relatively superficial to the skin as they run through the spermatic cord. With a relatively noninvasive and simple technique, anesthesia of the testicles and epididymis can be achieved. Innervation of the male urogenital system. If surgery is indicated on the testicle or epididymis, then certainly a general anesthetic is always an option. Obviously, this may be one of the only feasible options if the patient refuses to undergo a regional technique for the surgical intervention. A patient's refusal to undergo regional anesthesia for surgical procedures of the testicle and epididymis may often be rooted in the belief that he will be awake during the procedure and would just rather be "all the way asleep" for a surgery in this sensitive region. This can usually be addressed with some discussion of the block and the assurance that every effort will be made to make the patient comfortable, generally including monitored anesthetic care or conscious sedation. Again, note that patient refusal is one of the few absolute contraindications for performing any regional anesthetic technique. For more information, see Procedural Sedation. Anesthesia for surgery on the testicles and epididymis can easily be obtained by performing either a spinal anesthetic (with an insensate level of at least thoracic level 10) or an epidural anesthetic. Often, a spinal anesthetic is chosen because of the short duration of most surgical procedures involving these anatomic structures, the low failure rate of neural blockade, and the avoidance of the sacral nerve root sparing that is associated with epidural blockade. This last point is relatively important because the posterior elements of the scrotum are innervated by the perineal branches of the pudendal nerve, which are derived from the S2-S4 levels. In adult patients, caudal anesthesia is generally not performed because of a high failure rate in this population. However, caudal anesthesia is a viable and often used option in the pediatric population for postoperative pain control. A spermatic cord block is a relatively simple procedure that can be performed to provide anesthesia to the testicle and epididymis. The relatively superficial position of the spermatic cord near the external inguinal ring makes this an ideal position for placement of local anesthetic and anesthesia of the testicle and epididymis. Note that a spermatic cord block offers anesthesia to only the testicle and epididymis and not the overlying skin, including the scrotum and suprapubic region. This procedure is relatively straightforward and requires a minimal amount of setup to be performed. The patient should be positioned comfortably in the supine position. Placing a firm board or support underneath the buttock for the period during the block may be helpful. This accentuates the area and facilitates palpation of the spermatic cord, particularly in patients who are obese. Prepare and drape the patient in a sterile fashion. Palpate the pubic tubercle on the side that is to be blocked. In most patients, the spermatic cord can be palpated. Immobilizing the cord during the block with the nondominant hand, between the thumb and index finger, can be beneficial. Pass the needle directly downward in a vertical fashion, which brings it into the spermatic cord. After a negative aspiration for blood, inject approximately 3 mL of the solution into the cord. Repeat this step with some cranial and then caudal angulation of the needle so as to fan out the medication within the cord itself. Aspirate before each successive injection. Place the patient supine with a pillow under the knees. Palpate the anterior superior iliac spine (ASIS). Prepare the skin with antiseptic solution. Infiltrate the skin with lidocaine 1% 0.5 mL at a point 2 inches medial and caudal to the ASIS. Then insert a 25-gauge 1.5-in needle at that point and advance it at an oblique angle toward the pubic symphysis. Take care to not advance the needle too deep, into the peritoneal cavity. The image below indicates positioning. Ilioinguinal, iliohypogastric, genital branch of genitofemoral nerve blocks. After negative aspiration, inject 5-7 mL of lidocaine 1% in a fanlike manner as the needle pierces the fascia of the external oblique muscle. In recent years, ultrasound-guided nerve blocks are increasingly being used. Ilio-inguinal nerve blocks are easily performed with ultrasound guidance. The advantages of ultrasound guidance include safety, accuracy, and lesser doses of the drugs. The ilio-inguinal and ilio-hypogastric nerves are located in the layer between the internal oblique muscle and transversus abdominis plane. A linear ultrasound probe in thin patients or a curvi-linear probe in obese patients is used for the block. The first step is to identify the anterior superior iliac spine by direct palpation and then by ultrasound visualization. Next, the probe is slid slightly cephalo-medially in the direction of the umbilicus and the three layers of the abdominal wall muscles are identified, adjacent to the ASIS. The nerves are often identified between the 2nd and 3rd layers (internal oblique and transverse abdominis) as small hyperechoic round structures. Even if the nerves are not visualized, the layers are well visualized. After skin infiltration with local anesthesia, a 4" needle with an extension connected to the syringe containing the injectate is advanced towards the nerves deeper to the 2nd layer (internal oblique) and close to the 3rd layer (transverse abdominis) with direct visualization via in-plane approach. After negative aspiration, the injectate is injected in 1-2 ml increments with ultrasound visualization. This procedure is the same as the procedure for the ilioinguinal nerve block except that the needle entry point is 1 inch medial and caudal to the ASIS. The image below indicates positioning. Identify the pubic tubercle and the inguinal ligament. The needle entry point is just lateral to the pubic tubercle and just below the inguinal ligament. Take care not to advance the needle too deep, into the peritoneal cavity. The image below indicates positioning. After negative aspiration, inject 5-7 mL of lidocaine 1%. Retraction of the abdominal pannus is occasionally needed during this procedure in patients who are obese. This can be accomplished with the aid of an assistant or some appropriately placed tape. Aspiration prior to injection of local anesthetic is an integral part of this procedure. If aspiration is noted to be positive, withdrawal of the needle with application of pressure for 2-3 minutes can often prevent the formation of a hematoma. Good patient communication and a description of what is happening during the procedure is paramount in helping the patient relax during the procedure. It also can help decrease the patient’s movement; this, in turn, decreases the risk of inadvertent puncture of alternative structures and helps ensure the success of the block. Vasovagal reaction during the block or procedure itself: This mandates prior intravenous access before the procedure is performed. Puncture of the surrounding structures is possible, including the ductus deferens and the vasculature in the spermatic cord and the unlikely puncture of the bladder, bowel, and femoral vessels. A temporary or sustained neurapraxia is a possibility, as with almost any procedure involving a regional anesthetic technique. Malhotra V, Sudheendra V, Diwan S. Anesthesia and the renal and genitourinary systems. Miller RD, ed. Miller's Anesthesia. 6th ed. Philadelphia, Pa: Elsevier; 2005. Vol 2: Chap 54. Davis BE, Noble MJ, Weigel JW, et al. Analysis and management of chronic testicular pain. J Urol. 1990 May. 143(5):936-9. [Medline]. Waldman SD. Ilioinguinal nerve block. Atlas of Interventional Pain Management. 2nd ed. Philadelphia, Pa: WB Saunders; 1998. 285. Waldman SD. Genitofemoral nerve block. Atlas of Interventional Pain Management. Philadelphia, Pa: WB Saunders; 1998:. 365. Cohen SP, Foster A. Pulsed radiofrequency as a treatment for groin pain and orchialgia. Urology. 2003 Mar. 61(3):645. [Medline]. Yamamoto M, Hibi H, Katsuno S, Miyake K. Management of chronic orchialgia of unknown etiology. Int J Urol. 1995 Mar. 2(1):47-9. [Medline]. Zorn B, Rauchenwald M, Steers WD. Periprostatic injection of local anesthesia for relief of chronic orchialgia. J Urol. 1994. 151:411. Brown DL. Superior hypogastric plexus block. Brown DL, ed. Atlas of Regional Anesthesia. Philadelphia, Pa: WB Saunders; 1999. 293-302. Cutaneous distribution of the various nerves. The authors would like to thank Dr. Mariadas Chinthagada, their esteemed colleague, for his immense wisdom, experience, and suggestions.